Our price is inclusive of food, heating, litter, VAT and Insurance. Collection and Delivery rates available on request. Charges are calculated daily, starting with the day of arrival and include the day of departure. Fees include food (non-prescription diets), heating, veterinary insurance and VAT at standard rate. You also have our assurance that your cat will receive plenty of care, love, and attention throughout their stay. A full days boarding will be charged for afternoon departures. If your cat is collected before the end of the booked in period, the full period will still be charged. The minimum fee payable for periods will be two days. Notwithstanding the above, any part of any booking within the period December 23rd-January 2nd will be subject to a minimum of 5 days period charge. A discount of 10% applies to any cats staying for 30 nights or longer. Owners of cats staying longer than 6 weeks will be required to leave a 20% deposit on commencement of stay. For longer term boarding, accounts should be settled monthly. There is no discount for owners supplying their own food. Sundays and Bank Holidays by arrangement. If you wish to deliver or collect your cat outside of these hours we are happy to be flexible to suit your needs. We openly encourage all prospective customers to pay us a visit and to have a look around before they confirm their booking. Please contact us to arrange an appointment and discuss your personal requirements. 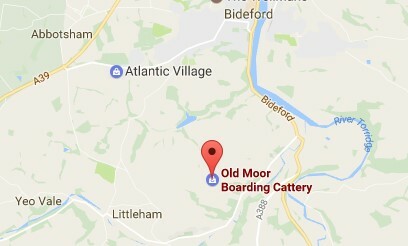 We are situated just a couple of miles from Bideford near Littleham.